The aim of the present study was to determine the range and mean of hematological parameters in clinically normal Awassi sheep. The study was conducted on 200 sheep 80 males; 40 ram lambs and 40 rams and 120 females; 40 ewe lambs, 40 pregnant and 40 lactating ewes, aged 7 months-4 years in Baghdad governorate / Iraq. Results showed that the range and mean + SE as following; Packed Cell Volume (PCV) 28-45and 33.2+0.27%, Hemoglobin (Hb) 8.6-15.1 and 10.8+0.09g/dl, Red Blood Cell count (RBC) 8.88-14.2and 10.54+0.083×106/ μL, Mean Cell Volume (MCV) 27.54-37.1 and 31.6+0.18 fl, Mean Cell Hemoglobin (MCH) 8.51-12.5 and 10.31+0.07 pg , Mean Cell Hemoglobin Concentration (MCHC) 30.44-36.41 and 32.5+0.10 g/dl , platelets 122-860 and 277.8+ 8.92×103/μL, Erythrocyte Sedimentation Rate (ESR) 2-17 and 8.82+0.27 mm/24 hrs, White Blood cell Count (WBC) 3900-13000 and 10032.7+184/μL, differential leukocytes counts; Lymphocytes (L) 1579-9271 and 5410+122/μL, Neutrophils (N) 1008-8288 and 4167.5+107/μL, monocytes 19-756 and 181.3+10.3/μL, eosinophils 0-1125 and 229.6+16.4/μL and basophils 0-188 and 31.3+3.17/μL and L/N ratio 0.42-3.3 and 1.44+0.04. However the means of following parameters; PCV, Hb, RBC and neutrophils count were significantly different between males and females (P< 0.05). Moreover the results revealed significant difference (P< 0.05) in some hematological values of different subgroups. In conclusion, this study recorded and established the normal reference range and Mean+SE of hematological parameters in clinically healthy Iraqi Awassi sheep. Keywords: Hematological parameters, Clinically healthy, Iraqi, Awassi Sheep. Study carried out with the purpose of evaluating the outcomes of dogs’ femur fracture unions by using intramedullary pinning and bone plating fixation. For the study, 8 adult animals, both males, weighing around 8 and 16 kg, were employed. The animals were divided into two similar groups and subjected to a simple complete transverse osteotomy on the left femur. 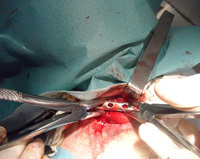 In group 1 (G1), the site of osteotomy was fixed by the intramedullary pinning, in group 2 (G2), an osteosynthesis by plates and screws were placed. The groups were subdivided into 4 periods (P15, P21, P28 and P35) for evaluating x-ray aiming to check local bone union process. X-ray studies showed that G1 developed a faster repair process in all observation periods when compared to G2. This fact was confirmed by radiographic evaluation. We conclude that the intramedullary pinning may be routinely used in orthopedic surgery, providing an early bone healing. Keywords: Osteosynthesis, Femur, Fixation, Radiology. Clinical mastitis is a disease that causes to significant economic losses in dairy farming. Milk yield losses and treatment costs, are some of them. This study aimed at to determining clinical mastitis treatment cost. Questionnaire forms were conducted on veterinarian clinicians. In accordance to the results of the descriptive statistics from the questionnaire form, average local treatment cost of clinical mastitis in per dairy cows was calculated as 22 TL. The incidence of clinical mastitis in only one lobe was found 61.38%. Average minimum cost of parenteral medicine use in per dairy cow was calculated as 54 TL where maximum cost is 116 TL. Keywords: Dairy Cattle, Mastitis, Treatment.